Above you can see Simon (Esterson, Eye’s art director) and Steve, the machine minder, checking the digital proofs from DawkinsColour, our repro house, against the first sheets off the press. This is called the make-ready stage, where the machine is being adjusted so that the colour is as close to our proofs as possible. I think there was a conversation going on about yellow tones at this particular point. Steve measures the weight of colour with a densitometer which enables him to fine-tune the amount of ink on the page. The machine minder’s desk is really a wonder to behold. 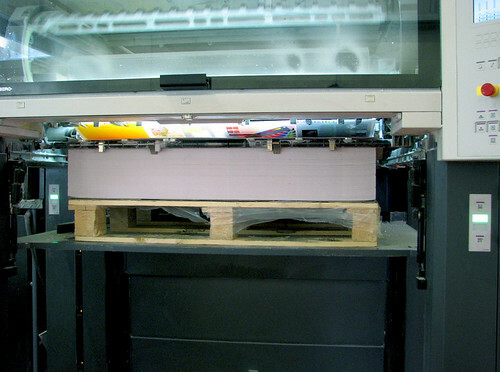 Beneath the sheet runs a long console through which he controls the ink to the press. 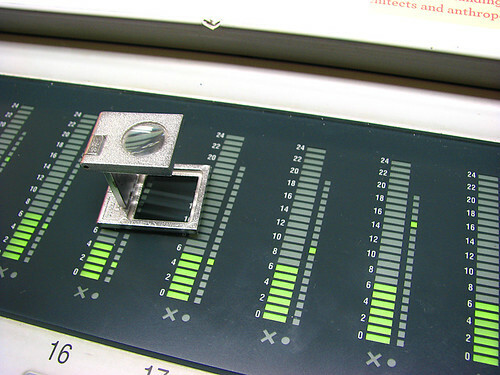 The sheet is split into vertical sections with each numbered read-out beneath controlling the ink ducts on that part of the sheet. It’s a fine balancing act, as changing the images at the bottom of the sheet also affects the ones at the top, so this stage can go through many iterations. 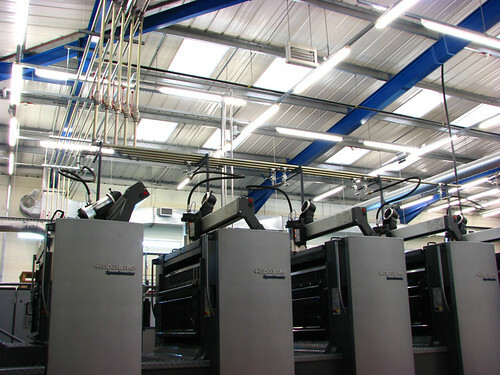 Beacon’s perfecting machine has ten colour units with a network of pipes above which transport the ink from large barrels to each of the massive printing units. 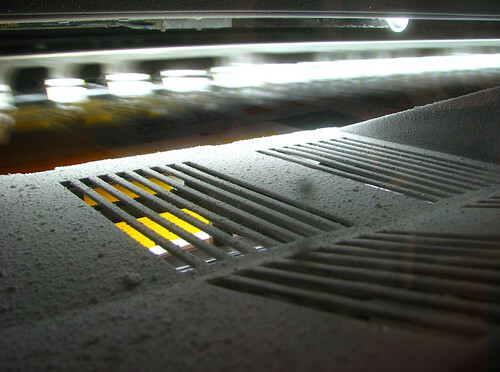 If you look closely at the delivery where the printed pages come out you can see a fine layer of spray powder which goes on to every sheet to prevent set-off. The powder has a minute thickness which creates space between each sheet, allowing it to dry without transferring wet ink to the page on top of it. It takes about 24 hours for pages to dry. 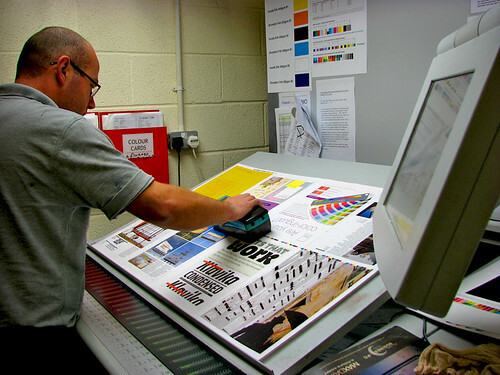 With seven sections each taking about 3 hours to print, you begin to get some idea of the timescales involved. The printed sheets stack on to a pallet. Later, a fork lift transports them to the bindery. 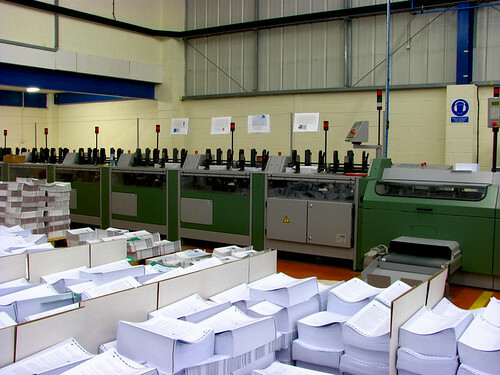 Over at the bindery we can see the machine for perfect binding. 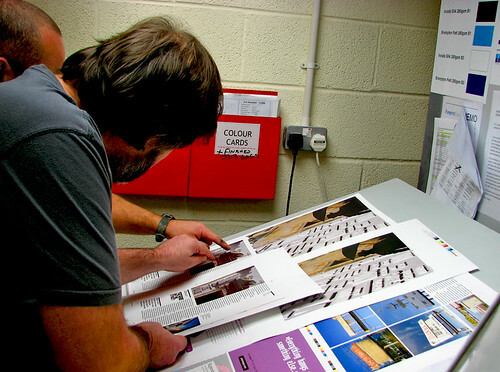 The printed sections are collated to make a complete magazine. The spines are clamped before it runs through the glue machine, the cover added and the individual magazines trimmed on three edges. The PUR glue takes about 24 hours to set really hard. At which point the new copies of Eye are boxed up and sent out to the distribution warehouse . . . and then on to shops and subscribers.